On the occasion of Ma. 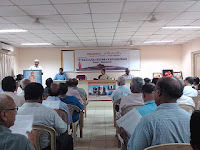 Eknathji Janmashati Celebration mysore branch of Vivekananda Kendra Kanyakumari organised Safal Yuva- Yuva Bharat Yuva sammelana” on 26th July, 2015 morning 10 am to 1 pm at Vivekananda Kendra, Meru, 2830, 1st main, Jayanagar. Convention started by prayer by Kum. Sindhu of Maharani Science college. Sri N S Chakravarthyji, Retd. Secretary Govt of India spoke on Swami Vivekananda’s life and teachings. 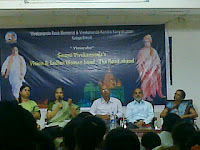 Sri Vinayaka Salimat, Yuva Raja college student talked on Swami Vivekananda and Society. Sri Ramesh, trainer, Survey Department training college spoke on Vivekananda Rock Memorial, Ekanathji and Vivekananda Kendra activities. Students from Maharani Science college, Sharada vilas Law and Degree college, Maharaja P U College, J S S P U College participated. Vivekananda Kendra, Branch-Tinsukia, Assam organized some free medical camps in Dibrugarh and Tinsukia districts of Assam. On 28th and 29th two camps were organized at Tingrai Balijan and Tingrai Borhola. 94 patients were examined in the first camp and the second camp was attended by 101 patients. The Lion K.K. Sasharia Eye Hospital, Dibruagh also conducted one eye screening camp on 29th at the same venue. 41 paints were screened and 12 cataracts were detected. 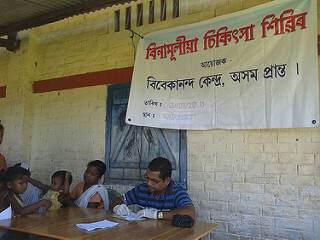 In continuation on 25th and 26th July another two more medical camps were organized at Borbam Proja Basti of Tengakhat block and Mautghat of Tinsukia district. In both camps 296 patients were examined and free medicines were distributed accordingly. 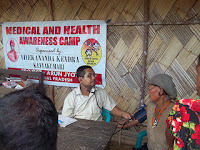 It is to be mentioned that Vivekananda Kendra Assam Prant has started conducting medical camps in the interior and tea garden areas of Upper Assam. 1 : Auditorium Inauguration at Itanagar on the auspicious occasion of Mananeeya Eknathaji Jananma Shati Parva. 2 : Sarthak camp specially organized for the the parents of the lifeworkers at Pushkar in rajasthan. 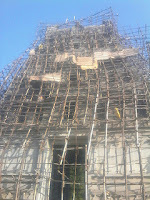 3 : Renovation of rameswaram temple by Vivekananda Kendra Natural Resources and Development Program. 4 : Statue installation of hanumanji and bharatmata at kanyakumari, in vivekanandapuram campus. 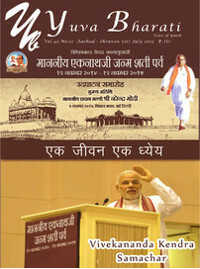 5 : Sthanik Karyakarta Prakshishan shibir at patana. 7 : Yoga Satra at guwahati. There was a Vimarsha on Swami Vivekananda's vision for Indian Womanhood at Vivekananda Kendra Kadapa. In the program the Chief Guest was Vice Chancellor, Yogi Vemana University. 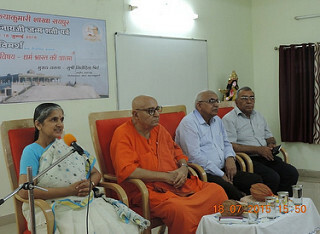 Nivedita Raghunath Bhide gave lecture on the subject. 1 “Sri Rama Jaya Rama” Mantra was chanted during Deepa Pooja, Shivalinga Pooja and daily by our Balwadi school children, cultural class students and during monthly meetings by our Balwadi teachers and Social Workers. Every month nearly 8, 56,443 times mantras were chanted in 84 localities. 2. Through 75 Balwadis, 1,855 rural Children were nurtured. In all the Balwadis, Malt along with hygienically prepared highly nutritive lunch with vegetables was served during the day. And in the evening vitamin-rich cereals were provided to the children. 3. In our Medicare Programme, 1652 patients were examined and treated for various common ailments, through 14 Rural Medical Centers in Kanyakumari, Nellai and Thoothukudi districts. 4. Eye camps were conducted at 5 places, in Kanyakumari, and Nellai districts in which 598 were treated for their eye ailments and 128 were operated for cataract. 74 persons given eye drops and 52 persons given spectacles. 5. 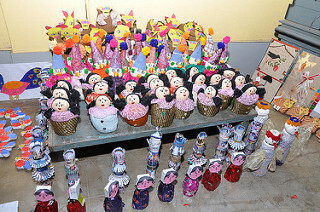 In 186 Samskara Vargas, 6,936 students participated. The students were taught about the values of Indian Culture, through games, lectures & lessons. The feelings of oneness were strengthened among participants, through patriotic songs and games. 6. Under Adopt a Grannie Programme, 26 destitute and old people were provided with monthly solatiums, in the form of rice, dhal, oil, etc., for their livelihood and 97 persons provided rice only, in Southern four districts of Tamilnadu. 7. Monthly Deepa poojas were organized in 218 village temples in five districts of Southern Tamilnadu, in which 9191 ladies participated and offered prayers for the welfare of self, family and the society. 8. Under Amrita Surabhi Scheme, our Kendra workers collected 477 Kgs of rice from five districts. 10. 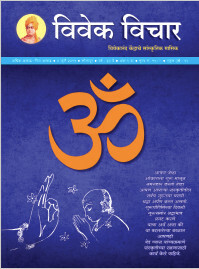 Vivekavani Subscriptions for 101 for one year, two Yuva Bharathi collected. 12. Yoga Varga has been conducted at 02 places, Kovilpatti and Aruppukottai in which 22 persons attended. 15. Shivalinga Poojas were conducted at 03 places in Kanyakumari District and 169 members participated. 16. Durga Pooja was conducted at 03 places, in Kanyakumari District in which 188 devotees participated. 17. Balwadi teacher refresher camp was held from 30.06.2015 to 03.07.2015. 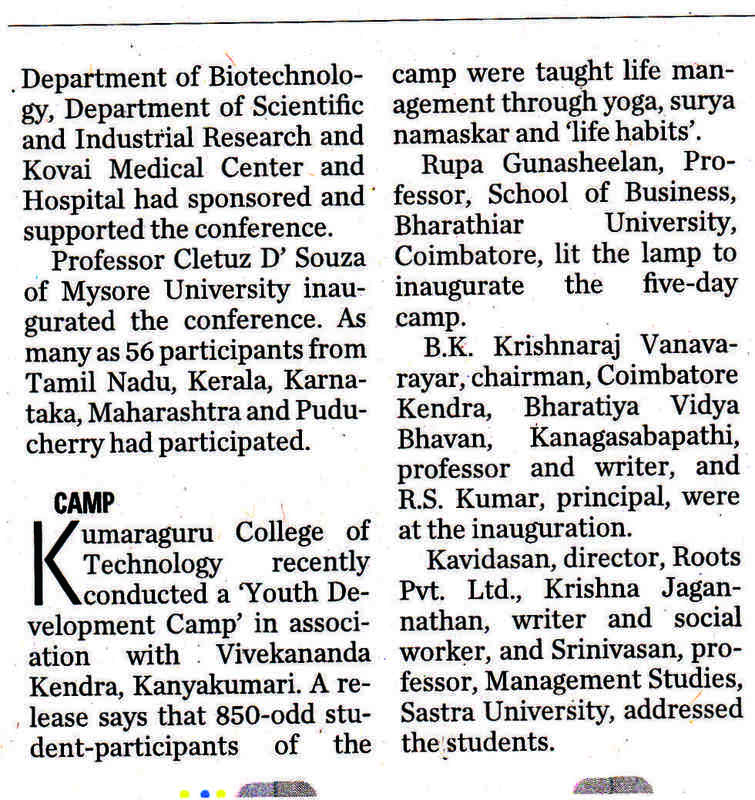 Teachers from Kanyakumari, Tirunelveli, Thoothukudi, Ramanad and Virudhunagar districts attended the camp. 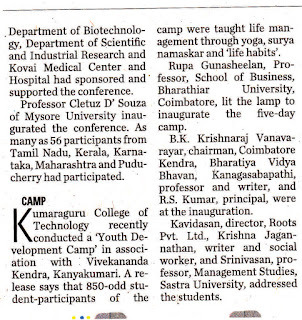 Totally 114 teachers and 30 trainees attended the camp. During the camp all the teachers were well trained. 18. Parents meeting was conducted at 2 places in Kanyakumari district and 31 persons participated. 19. 1008 Deepa Pooja conducted in Ambasamudram ( Nellai district) and Nainar Kovil (Ramnad district) where 1749 devotees participated from 52 villages. In our balwadi Selvi. V. Madumitha aged about 4 ½ years studied. At present she is living with her father and not coming to our balwadi. They have joined her in the nearest balwadi there. Daily she has continued the practice of saying Sri Ram Jeyaram for 11 times in the morning and without the prayer of Bhramarpanam she will not take any food. Her teacher asked who has trained her like this. Madumitha told them that Kendra balwadi teacher has taught and trained to behave with good manners. Still now she is practicing the same habit every day. Her mother came to me and told all these matters and wondered. This inspired me very much. My cultural class student Selvan R.Murugesh has joined in a company for a job. Three months have gone and after availing two days leave he came to our place. He gave me a gift article along with a pen. I asked him the purpose for the gift. From the first month salary he has bought clothes for his parents and gift for me. Further he told me that in order to give respect as a balwadi teacher and cultural class teacher he has offered the gift. Because during his childhood he was delicate and shy. He asserted that only because of me all his shyness have gone. All those past memories made him feel so happy and grateful. Sri. Tamilmaran who belongs to Kootalumoodu village used to speak in debates on stage. He was good at debate. 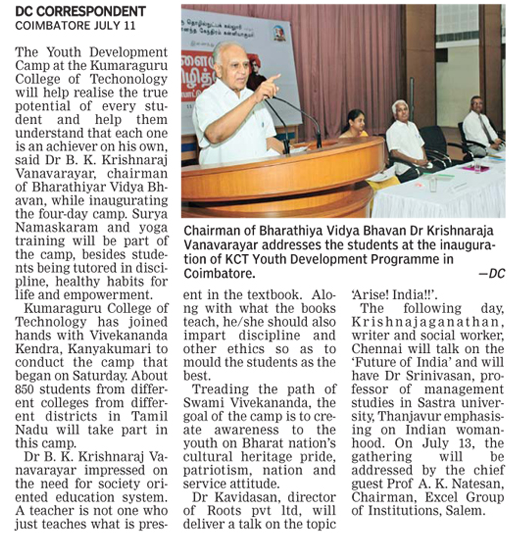 He visited Bharathi Educational Institute. He whole heartedly told all the people that because of Vivekananda Kendra he was able to become good at debate. When he was a small boy he participated in an elocution competition. He spoke about Lord Krishna and won the first prize. That was his first competition which he cannot forget. That inspired me very much. 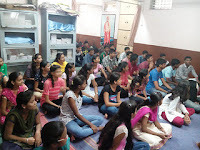 Yuva Prashikshan Shibir on 18th july 2015 @ Vivekananda kendra Dadar Branch. Total 70 students taken prashikshan of Swadhya varga (Study circle) and sanskar varga. Kum. 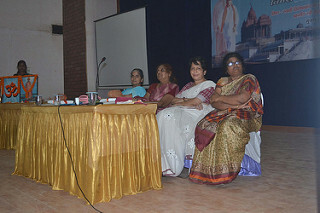 Prajakta Khedlekar, Smt Madhavi Sant and Sau. Shubhangi Joshi conducted 7 days workshop in order to spread awareness and teach the students techniques of Yoga. Shri. Madhukar Deshpande presided the function. 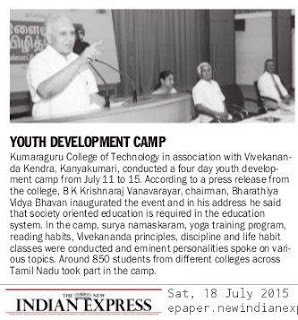 A Pariwar Sammelan was organised by VK Baleswar on 8th July 2015. The Pariwar Sammelan started with Bhajan Sandhya. Mananeeya Nivedita Didi talked about ‘Adarsha Pariwar’ on the occasion. Around 100 well-wishers participated in the programme. 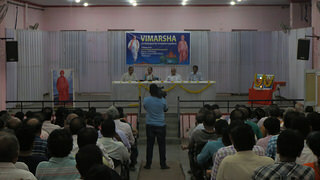 VK Bhubaneswar organised a Vimarsha on Expressions of Oneness for the elites of Capital town. More than 120 elites were present for the lecture and participated in the discussion. Mananeeya Niveditadidi told, we all are inter-related, inter-connected and inter- dependent, if we doesn’t understand the truth we are going to destroy ourselves. The entire Bharatiya Sanskriti is based on this inter-relation, because we don’t say there is unity in diversity but we see the diversity as manifestation of the One – The Ishwara. If we understand this oneness and accept this diversity the entire world will be peaceful, there will be no atrocities on the name of colour, cast or religion. A meaningful discussion followed the lecture. 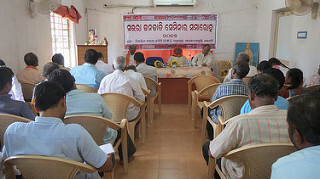 VK Baripada organised a deliberation on Oneness: India’s message to the world. The focus of this programme was on Janajati. 69 Elites from the 2 major Janajatis Munda and Santhal were present for the discussion. Mananeeya Niveditadidi told that the central theme of Indian life, may it be Gramvasi, Nagarvasi or Vanavasi is Oneness. 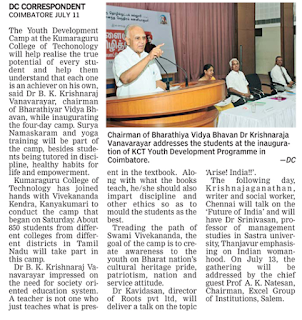 Dr. Rout, CDMO was also present on the occasion and he remarked that Vivekananda Kendra’s activities should spread to make the people understand Swamiji’s life and message. VK Brahmapur organised Vimarsha (A dialogue for Creative Leaders) on 6th July 2015. The topic for the discussion was ‘The Ideal of Seva’. 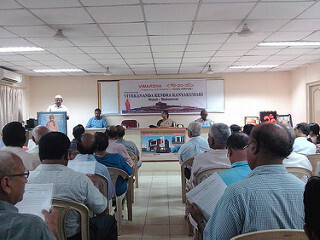 Mananeeya Niveditadidi told about the concept of Real Seva – the formation of Ideal Social Order. Only fulfilling basic needs is preliminary seva but we have to form such a ideal society where the basic needs of everyone would be automatically taken care by. It was followed by question – Answer session. In the concluding remarks Prof. Pramod Kumar Sahu added that the society needs this real, ideal service for the better social and spiritual life. An odia book on Kendra Prarthana ‘Lakhya o Path’ was also released on the occasion. The 250 elites from the Brahmapur town attended the programme. Under the aegis of VK- AICYAM, a seminar was organised on Traditional Systems of Sabar (Saura) community of South Odisha. The seminar was organised on 4th July 2015 at Paralakhemundi, headquarters of Gajapati district. 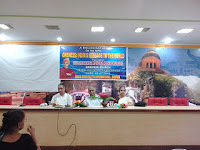 In the inaugural session Sri Ramananda Maharaj, Mahanta of Dei Math, was the chief guest and the Mananneya Nivedita didi was the chief speaker. In her key note address Didi, emphasised on the necessity of such seminars where participatory research is done. She also told that it was Sabar janajati which recognised Sri Rama and Sri Krishna as Bhagawan. It was Sabari who worshipped Sri Rama and waited years for his arrival and it was Vishwavasu who recognised that Nilamadhaba is Jagannath. Three papers were presented in the technical sessions, Oral History, Gods and Goddesses and Festivals, the third paper was on Marriage rituals. All the three papers were discussed thoroughly. In the concluding session, Nivedita didi mentioned about extensive research in this field and how we can modernise our communities to keep pace with the changing times keeping our traditions intact. The concluding was followed by cultural programme. 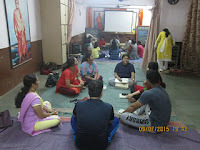 Vivekananda Kendra Kanyakumari, Dadar Branch started Yoga Instructor (Teachers) Course YIC from 6th july - 12th sept. 2015. Total 32 participants taken admission for course.Daily 2 hrs, 6.30 pm to 8.30 pm except Sunday sessions will be held. In first month daily 1 hrs theory on various dimensions of yoga like Astang yoga, karma yoga, bhakti,gyana yoga, anatomy, swami vivekananda etc. and 1 hrs practical session. After first month daily 2hrs practical training will be given. 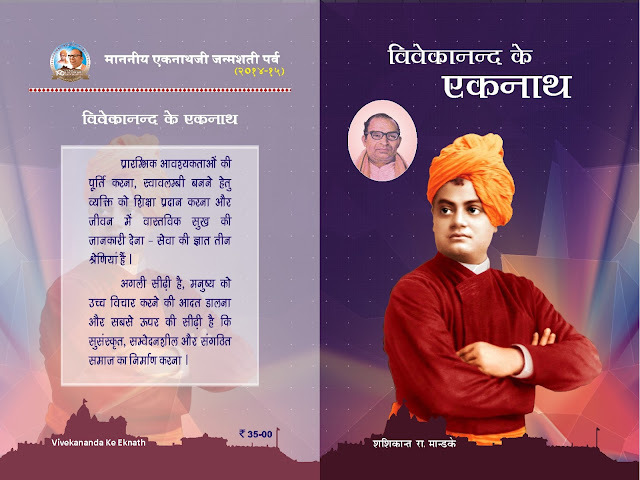 After completion of course certificate of vivekananda kendra will be given to participants. Vivekananda Kendra Nagdandi Kashmir organised a week long Science workshop for the students of class VI to XII of various schools of Anantnag Dist along with the collaboration of Gyan Setu, Pune. Nearly 725 students from 12 schools got benefit of the programme.5 resource persons from Pune conducted the workshop. There was a overwhelming response from the students, teachers and management of the schools. Science concepts in the text books were taught in a very innovative way. Songs and games were also the part of the workshop. Mananeeya-Eknathji-JANMA-SHATI-PARVA-300Many a time there may not be anything objectionable in a particular programme as such, but the worker who conceives or organizes it does attract criticism if he in his over-enthusiasm fails to observe the organisational norms and appears to act arbitrarily, bypassing his seniors or co-workers. The website has been started on Rashtra Chintan Diwas, a First day of Samartha Bharat Parva, and till now14,80,806Suryanamskars have been registered.